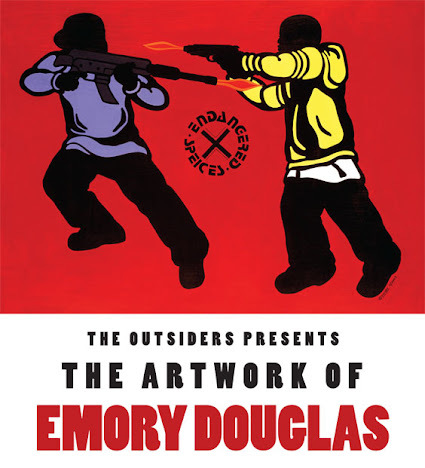 The Outsiders is proud to present an exhibition showcasing the works of revolutionary artist Emory Douglas from 18 August. Emory Douglas is a pivotal figure in the development of political graphic art. Appointed ‘Minister for Culture’ for the Black Panthers in 1967, he became in-house illustrator for the quasi-revolutionary civil rights movement’s eponymous newspaper. Douglas’ instantly recognisable graphics filled the incendiary journal and would form its back page, a ‘cut out and paste up’ propaganda poster. In and out of youth detention as a teen, Douglas kept busy working in the print shop of Ontario’s Youth Training School. Encouraged to draw by social workers, he went on to study commercial art at San Francisco’s community college, where he learned to use collage and what would today be called ‘found media’ to create high-impact pieces using minimal time and money. Employing a ‘DiY’ ethos to make potent, populist imagery re-enforced by slogans is a defining characteristic of many of today’s heralded street artists. The Outsiders gallery group is also home to a massed collection of political art from throughout the modern era, including the Situationists’ ‘Mai 68’ posters. For these reasons Emory Douglas’ art makes a proud and worthwhile addition to our roster.